The VAR / Reseller Agreement is used when allowing a third party to resell your products or services to their customers. This is typically used when selling higher priced services or allowing the VAR to stock your products or sell them directly from their web site. for creating such an easy to use software Contract Pack for our business team. This has been a huge help to our firm." This Reseller/VAR Contract is included in editable Word format that can be customized in Word or by using the included Wizard software. How do you write a Reseller/VAR Contract document? THIS AGREEMENT is made this Current Day day of Current Month, Current Year by and between Company Name (hereafter referred to as "VAR or Reseller") and Company Name (hereafter referred to as "Company"). The purpose of this Agreement (hereafter referred to as the "Agreement") is to precede a longer-term contract arrangement under which Company Name will provide Reseller services on behalf of Company Name. As a service, the standard VAR agreement with the Company is provided below. Subject to the terms and conditions of this agreement, Company grants the VAR a non-exclusive right to resell its products and services to the VAR's customers. The VAR shall maintain a sales office for product promotion and is responsible for all costs incurred for the promotion and sale of Company products and services. The VAR shall conduct business in its own name and shall not represent itself as an employee or agent of the Company. Prospects may be registered with the Company and will be protected for 90 days. This protection may be renewed at the Company's discretion for a further 90 days. End User pricing and VAR Compensation is outlined on Exhibit A, attached, and is subject to change at the sole discretion of the Company. Terms of payment are C.O.D. unless credit approval has been granted by the Company. If credit approval has been granted, credit terms are net 10 days upon receipt of invoice. The Company reserves the right to revoke any credit extended if payment is in arrears or delinquent for more than 30 days. Proprietary Information exchanged here forth shall be treated as such by the VAR and held in the strictest of confidence. This information shall include, but not be limited to, the provisions outlined in this agreement, product and services information, pricing, source code, company practices, methodology and procedures. The VAR further agrees to not distribute, decompose, disassemble, decode or reverse engineer any Company program delivered to the VAR or any portion thereof without prior written approval of the Company. The VAR may not assignor transfer this agreement, in whole or in part without the prior written consent of the Company. In the event that the VAR contemplates whole or partial sale of its business, ownership change, or a change in its jurisdiction, the VAR shall notify Company Name by mail, facsimile or email no less than 60 days prior to the effective date of the event. The term of this agreement is twelve (12) months from the date of execution by the Company. This agreement shall be continuously renewed every twelve (12) months unless the VAR notifies the Company in writing thirty (30) days prior to the expiration date. The Company may terminate this agreement at its sole discretion upon the occurrence of one or more of the following events. 1) failure to comply with any provisions of the agreement upon receipt of written notice from the Company of said failure, 2) appointment of Receiver or upon the filing of any application by the VAR seeking relief from creditors, 3) upon mutual agreement in writing of the Company and VAR. If legal proceedings are commenced to resolve a dispute arising out of, or relating to this agreement, the prevailing party shall be entitled to recover all costs, legal fees, and expert witness fees as well as any costs or legal fees in connection with any appeals. The VAR shall indemnify and hold the Company harmless from and against any and all claims, judgments, awards, costs, expenses, damages and liabilities (including reasonable attorney fees)of whatsoever kind and nature that may be asserted, granted or imposed against the Company directly or indirectly arising from or in connection with VAR's marketing or support services of the product or services or the unauthorized representation of the product and services or any breach of this agreement by the VAR. The Company warrants that the product will substantially perform the functions or generally conform to the specifications published by the Company for the product. If it is determined that the product does not operate according to such documentation, the Company's only responsibility will be to use reasonable efforts, consistent with industry standards, to cure the defect. Neither party shall be held responsible for delay or failure in performance hereunder caused by, acts of nature, strikes, embargoes, fires, war or other causes beyond their reasonable control. If any provision of this agreement is held to be unenforceable, the enforceability of the remaining provisions shall in no way be affected or impaired thereby. This agreement and any disputes arising hereunder shall be governed by the laws of State state, without regard to conflicts of law principles. A failure by any party to exercise or delay in exercising a right or power conferred upon it in this agreement shall not operate as a waiver of any such right or power. 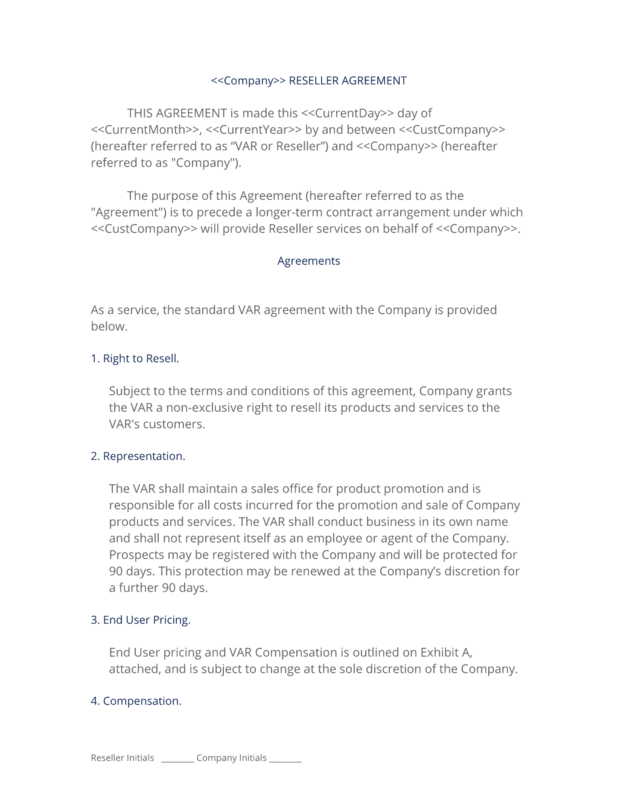 The complete Reseller/VAR Contract - with the actual formatting and layout - is available in this Contract Pack.